The aircraft impacted the terrain shortly after takeoff from runway 15 at Toluca International Airport in Mexico. The airplane was partially consumed by the post-impact fire and the two pilots onboard received fatal injuries. During takeoff, at a speed above V1, the flight crew received a warning that the no.1 engine thrust reverser had deployed. The takeoff was continued and engine power of engine no.1 was reduced to idle. During initial climb the flight crew inadvertently deployed the drag chute. The airplane banked left and the crew lost control of the aircraft. "Loss of control of the aircraft during the emergency procedure of indication of the deployment of the reverse of the engine number one during the take-off run above V1, which was consistent with the training and standard operating procedures that call to continue the take-off, causing the collapse of the aircraft, by low speed and the operation of abrupt maneuvers and turns towards the engine side in IDLE position and commanded opening of the Drag Shut for lack of an adequate CRM". 1. False indication of reverse display of dwelling position number one. 2. Failure of pilots of previous flights not to refer failures to indicate the deployment of reverses for maintenance actions. 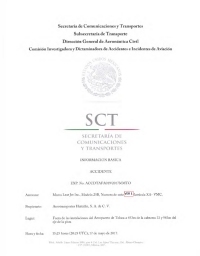 Distance from Toluca-Licenciado Adolfo López Mateos International Airport to Durango-Guadalupe Victoria Airport as the crow flies is 734 km (459 miles).